Since in 13th century people have learned to cover the glass with a thin layer of tin to give a surface ability of reflecting light and other radiation, the mirror has firmly entered into the everyday life of mankind in various fields. Designers and their customers are interesting about domestic use of mirror interior decoration. 50+ design ideas to reflect your style, we hope, will help you to have an impression about how do you want to use this nice thing within your own homey atmosphere. The days when the mirror is used solely for its primary function, reflection of objects, are gone long ago. The ability to visually increase the space, to correct the geometric imperfections of space, multiply the illumination of rooms and serve as an excellent decor element are actively used by designers and owners of apartments and houses all over the world. Also, it is difficult to find homeowners who doesn’t have a mirror in the bathroom, hallway, and possibly on the bedroom door. Use of this, perhaps, the most magical decoration extends to a much larger number of functional spaces and areas of use. Decorative potential of mirror surfaces is truly versatile. The ability of mirrors to transform the space, change its geometry and the perception of the overall image allows each homeowner to express his or her attitude to the design of the home. 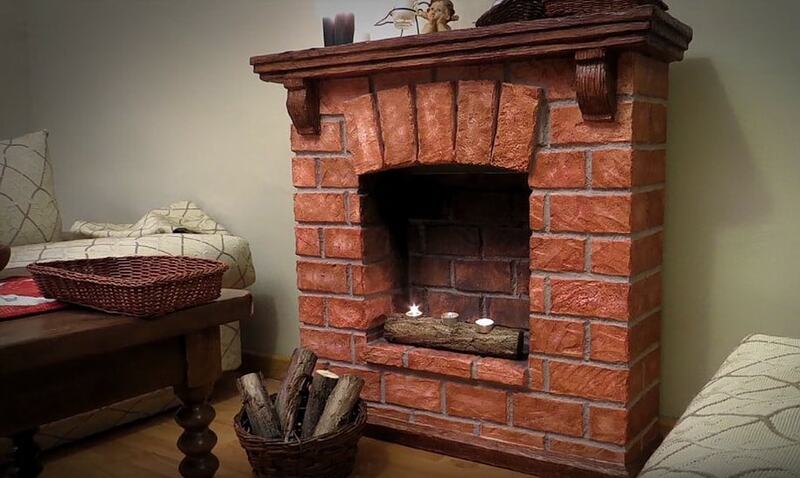 Which means to create a totally unique design with simple and inexpensive decorative solutions. Mirrors visually increase the volume of small and narrow corridors and hallways solving the eternal problem of apartment buildings of the last century. But lone small mirror in a narrow corridor scarcely cope with the task of visual expansion of the space. It will take the whole composition of the mirrors, designed in accordance with the selected interior style. Reflecting on several mirror surfaces, artificial lighting will create a feeling of spaciousness even in a small square room. 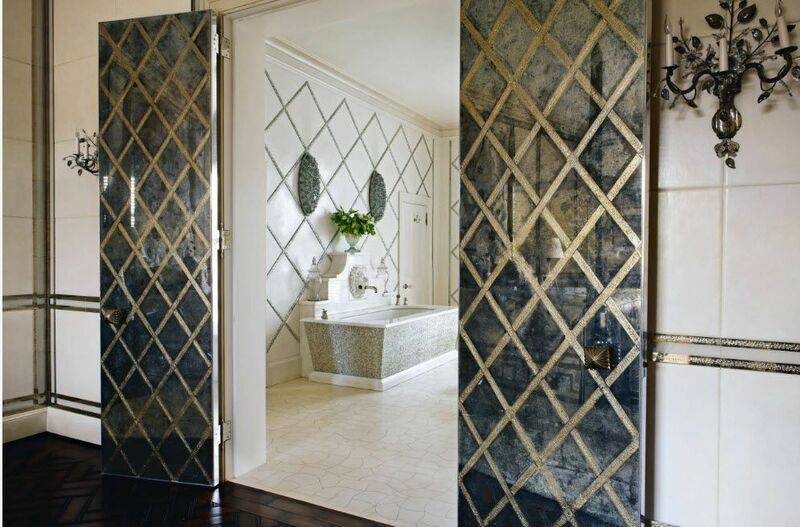 When placing mirrors in narrow spaces, it is important not to overdo it with reflections. If parallel mirrors reflect each other, you will risk not only to achieve distorted picture of the interior, but also face a psychological dissonance – your own reflection will multiply. It is better to hang a mirror in front of a picture of a favorite story or a family photograph. Mirrored surfaces are effective assistants in the creation of unique decor for a wide variety of functionally divided places. You can create an original decor in the living room, bedroom, hallway or bathroom that can’t be found in any other dwelling . The use of “fragmented” mirror to produce panels, distorting mirrors which are intentionally aged and patina veiled; rubbed to a high gloss aluminum surfaces; steel, copper and silver plates (plates) – all of these methods allow you to create not only creative design, but also reflect your attitude to the interior beauty. The mirror “meets” us are literally at the entrance of any modern home – in the hallway. We can see the mirror surface in the living room, private rooms, office and library, dining room and even at the kitchen. Each room has its own specifics of placing the reflective surfaces and the way of creation of unique image. In some rooms the priority of mirrors’ usage corresponds to their main purpose, in others – the decorative qualities are put at the forefront. Depending on the size of the room, its functional and stylistic trends in the design, the mirror may appear before the hosts and guests of the house in various forms. 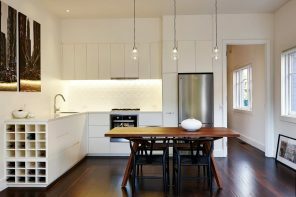 It can be from the surface of the coffee table to the elements of the kitchen hood. The space above the fireplace is considered a traditional layout mirrors for the living room. This is due to the fact that it was the mantelpiece to accommodate the candlesticks. As a result, fire from the candles was reflected in the mirror and multiply, illuminating the room space for the whole family gatherings and setouts. Nowadays, candles are used infrequently, only to create a certain atmosphere in the living room. And mirrors over the fireplace reflect tube-lighting from the central chandelier or wall sconce that is often placed on the both sides of the fireplace for symmetry. No living room is complete without a coffee table. Mirror surface of the countertop will not only reflect the light from the central chandelier, but also may become harmonizing element for the mirror on the wall. The authenticity of the performance of both interior parts will become living element in the picture. The mirror surface of the coffee table can become furniture legs either. Such element is not only appropriate for most interior design styles, but also is recommended for introducing a touch of luxury and glitz in the design of modern facilities. Decorative compositions of the mirrors in different execution variations are great opportunity to decorate the living room wall. Depending on the size of the room and the chosen design style, it can be several identical mirror elements or panels made of disparate at first sight “puzzle”. The main thing is that the resulting wall décor should emphasize the mood and character of the space, its individuality. Such a composition can be hung above the sofa or a pair of chairs facing the wall, and on the low storage system like a dresser. 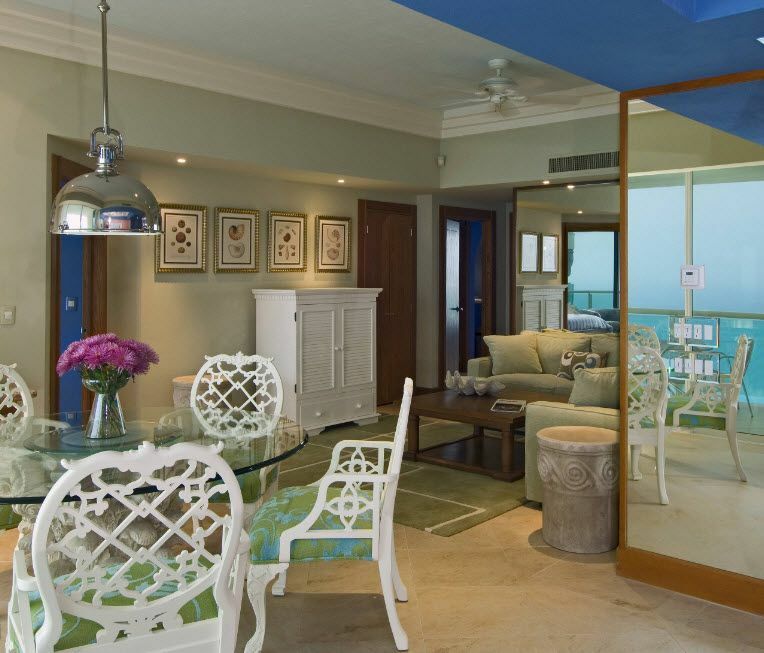 It often happens that a mirror becomes key element of the room’s interior. If the owners of the home have an antique mirror in a beautiful frame, emphasized with patina rarity product, it is not surprising that the entire interior design of the room, where the latter is located, is built around this focal point. For many people mirror in the bedroom associates with door of built-in closet. Of course, it is convenient and practical way to not only provide yourself with big mirror, necessary for creation of the daily image, but also to increase the space of often small rooms for sleep and rest. In the bedroom you can use mirrored surfaces not only as inserts or webs of cabinet doors. 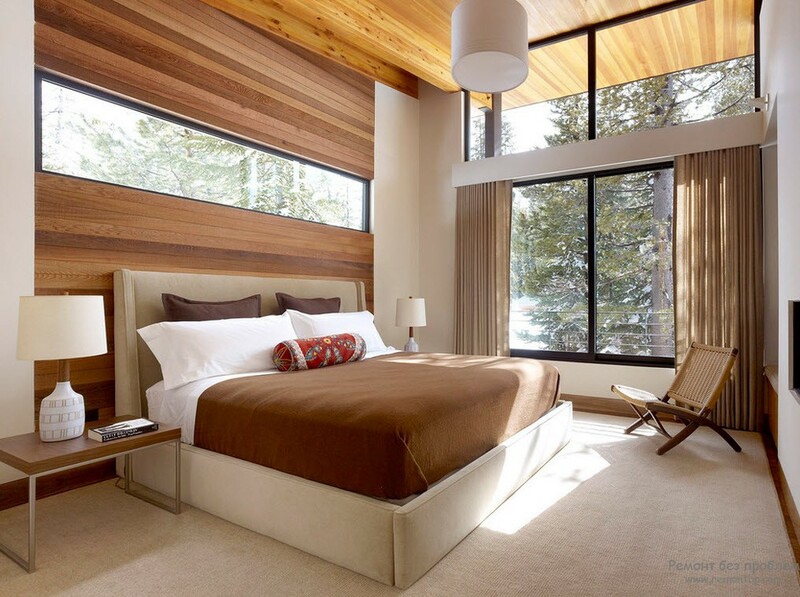 The composition of the mirrors of different shapes or one large panel of the mirroring pieces above the headboard will decorate the interior and bring uniqueness to the design of the room. Bedside table with glass facades is cult household item for designers all over the world. Cabinets with mirrored surfaces are perfect for small spaces. They are seem to dissolve into the interior of the bedroom, but at the same time emphasize the symmetry of the layout, being located on both sides of the bed. Bedside tables, facades of which are assembled from small mirror elements have even more original look. Unusual optical effects of reflective surfaces bring a touch of glamor and glitz to the interior of the bedroom. If you think that mirrored stand is not enough for the bedroom space, you can go further and order a mirror finish for bed’s frame. Some manufacturers already produce such beds in their standard lines of models. If you want to increase the number of soft, diffuse light coming from the desktop lamps or floor lamps with shades? Hang a mirror behind them. Aside from the obvious functions of lamp light reflection mirror will help to maintain the symmetry of the bedroom ambience – the bed in the center and of the composition of the tables with table lamps on its sides and the mirror over them. If the items of your wardrobe are here in the bedroom, and every morning you pick up the image for the coming day in this room, a large full height mirror is must have thing for the interior. If the area of the room allows, you can use a mirror in a frame mounted on the bedplate. The advantage of this design in its mobility. The mirror can be rearranged in any part of the room. If each square centimeter area of the bedroom is “reserved”, it is better to confine ourselves with the wall option or mirror canvas of built-in wardrobe façade. Only at first glance it may seem that a mirror in the baby’s room is dangerous and do not carry a functional and decorative load. If a piece of furniture is made of mirror surfaces, firmly attached to the frame or base, if the edges of parts processed and smoothed, so there is no threat to the child. Young children are very fond of looking at their reflection, and this piece of furniture will be interesting for the child for a long time. Mirror as wall decor also will not pose a danger to the child, if it is securely attached to the wall and placed in a smooth frame without sharp elements. Often, to enhance the security of the mirrors, they are coated with a special film, which prevents the formation of fragments during splitting mirror if it falls. Even in the worst outcome, a child can`t be cut by debris. The interior of the dining room mostly use mirror surfaces as decorative elements. See yourself in a mirror during a meal is not just bad luck and negative Feng Shui. Such thing is not desirable in the meal room from the point of view of psychology. Therefore, the mirror panels consisting of “fragments” and a variety of compositions with reflective surfaces are arranged on the walls at the height of a standing person eye. So you can’t see the reflection when sitting at the table. Not only mirrors on the walls, but the facades of the storage system can serve as a decorative element, which, among other things, visually expands the space frontier. The interior dining room you can usually find showcases for storing utensils (glasses, wine glasses and tea sets), as well as chests of drawers with cutlery, tablecloths and napkins sets. The mirror surface can be used in the first instance as an alternative to glass pane windows, as well as in the form of primary or secondary material for fronts of drawers and low cupboards. Mirror surface within the kitchen space? It is easy, and it’s not just about reflective properties of countertops, stainless steel Are glass inserts on the doors of cabinets or appliances. Mirrored surfaces in the kitchen interior of modern style and high-tech meet incredibly often. Most often, large appliances, such as refrigerators and hoods, can “boast” with their ideal reflecting properties. It can bring not only gloss and spirit of the present to the interior, but also the originality of execution of the traditional elements in functional space of the dwelling. Traditionally, mirror is hanging above the sink in the bathroom. Modern design projects for water treatment facilities often propose two sinks, over which is placed a single large mirror, a pair of similar models that emphasize the interior symmetry. 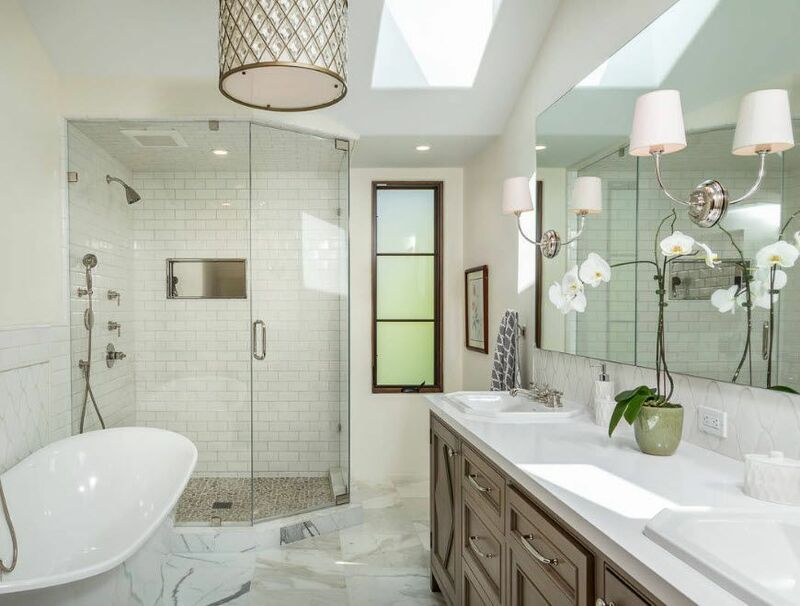 When it comes to the classic design of a bathroom, a large mirror can be arranged in a frame with carving and stucco or imitation made of wood, which was used for the manufacture of storage systems. Simple and concise solutions are more appropriate for a modern bathroom decoration styles. Often the mirror is placed on the wall above the sink or without a frame at all or mimicking the surface finish of the wall. If the mirror is large, the existing light sources may occur insufficient for the effective illumination. In this case, they can be mounted directly through (yes, literally through) the mirror surface. The bathrooms of standard block of flat apartments or condos as a rule can’t boast of not that big, but even enough space. 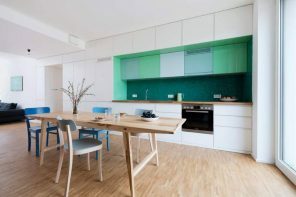 To visually increase the small space owners use every possible design techniques: a white palette design, glossy finish (ceramic tiles) and, of course, mirrored surfaces. Designers offer to be not limited to a small mirror over the sink but also use a mirror panels as a finishing material for partial decoration of walls in this functional area. Many housewives in addition to water and hygiene procedures go for make-up and make styling in the bathroom. Therefore, in addition to the main large mirror on the wall, they are often use a small mirror surface (often with a zooming effect for more easy application of makeup) on gooseneck that allows you to adjust the location of the object in front of the face. If your bathroom has a sink, then to hang a mirror above it is a mandatory design course. Most often the toilet is allocated in very little place, and the mirror will help to increase its visual perception in this case. Not to mention the basic functions of the mirror surface.